Taste test: These are really good chips. They've got a spicy Thai flavor that doesn't operpower you, they're quite crunchy, and they're delicious. Smell test: Nice spicy Thai food aroma. From the package: “Thailand — the name alone conjures up visions of this exotic country where unique and complex Asian cuisines abound. It was also the inspiration for our Thai potato chips. Made with soy sauce, ginger, rice vinegar and traditional Asian spices, our Thai chips are made the only way we know — naturally. 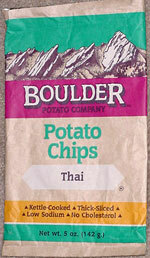 "Like all Boulder chips, our Thai potato chips are kettle-cooked in small batches using only high monounsaturated sunflower and/or safflower oil, which are both extremely low in saturated fat. This snack was discovered by Jeremy at Whole Foods Market, Evanston, Illinois.